Why don’t more entrepreneurs drive to the money? I think it’s because just about everyone would rather engage their inner artist/creator over their inner salesperson. Don’t feel bad about it- we’re just wired that way. That said, if you want to buck the odds and make yourself a successful entrepreneur you need to diverge from the herd. One such divergence is asking for money sooner and more often than you’d like- for most of us, a lot sooner and a lot more often. Let’s start with some inspiration. Remember that scene in Good Will Hunting where Ben Affleck impersonates Matt Damon’s savant character in an interview with a fancy think tank? And he asks for $200? I’m not saying engage customers that way, but if you’re feeling timid try to connect with Ben’s bravado. One more example: I remember going to a ‘business’ workshop as an undergraduate. The organizers did a sales exercise where you had to convince the other person to give you a handful of pennies. The solution to the exercise was just to ask for the pennies- nothing else would make the counterparty give you the pennies. Most people didn’t get it (myself included). When, how and why should you ask for the money? For starters, will a customer pay you to build it? If that sounds audacious, consider the amount of software that organizations build for themselves. Much of that could be better supplied by 3rd parties if it weren’t for the overhead of identifying, contracting, and managing a third party relationship. Breaking down those kind of barriers is part of your job as an outlier, the successful entrepreneur. If you can get that done, you’re off to a great start. If not, get your MVP out the door, emphasis on the M. Will they pay for it now? If so, great. If not, will they pay for a concierge version? 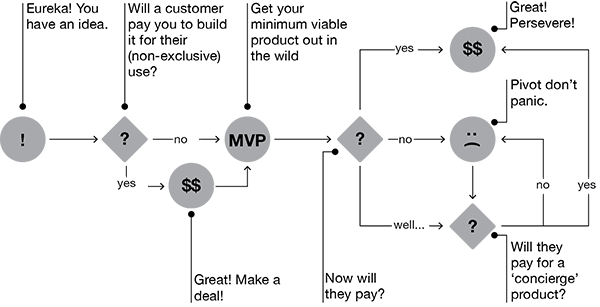 Consulting is a great way to bootstrap a product idea, even if you’re billing below market (see my previous post on this). They still won’t pay? Don’t panic but it’s time to go back to customer discovery and validation. 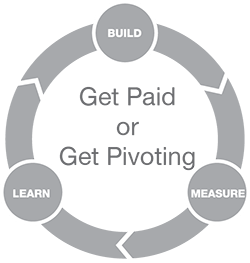 While some of this is more straightforward in B2B, many B2C ventures find themselves needing to be more focused on the money. Witness this extremely honest and insightful post by the founder of Referly. This entry was posted in Insights, Principles and tagged alex cowan, BCYF, BCYF CBS, CBS, eric reis, Eric Ries, Guita Gopalan, lean startup, Lean StartUp Circle, Lean StartUp Circle Manila, Lean StartUp Circle Philippines, Lean StartUp Manila, Lean StartUp Philippines, leanstartupmnl, manila, Minimum viable product, Noreen Bautista, philippines. Bookmark the permalink.